Usually when the two best teams in a conference play, a victory isn't considered an upset. Yes, there's a favorite and an underdog, but when you have two teams vying for a spot in the NBA Finals you shouldn't have a shocking result, right? Well, if the Celtics' Sunday night victory over the Cavs in Cleveland isn't considered an upset, you're going to have to find a better word to describe it — Cleveland entered the game as a 16.5-point favorite in Las Vegas. The skepticism towards the Celtics was fair — they were going to play without Isaiah Thomas and they were following back-to-back blowout losses that were as embarrassing as anyone in the NBA can remember. But the Celtics turned in a superb second half in Game 3 and came back to beat the Cavs 111-108 on an Avery Bradley 3-pointer that rattled home with 0.1 seconds left in the game. It's good that you could show up for the conference finals, competitive basketball. We're happy you're here. How did it happen? Let's break it down. There wasn't anything, in particular, the Celtics were doing to limit James defensively — he just had a bad game. He scored 11 points in Game 3, his fewest this postseason — his fewest in his 58 playoff games. Going into Sunday's game LeBron had scored 30-plus in eight straight contests. Then, on Sunday, he didn't make a basket in the last 19 minutes of the game. There's no other way to put it: that's weird. It was particularly peculiar because James had been feasting against the Celtics in Games 1 and 2 — he scored 26 points in the paint in the series opener and 12 of his 30 overall points there in Game 2. LeBron is an unselfish player, but it was bizarre to see him so passive — it harkens back to some of his early days in Miami. The Celtics' big men — if you can call them that — have been a disappointment in his series. Al Horford was a non-factor in Games 1 and 2 and Kelly Olynyk (remember him? 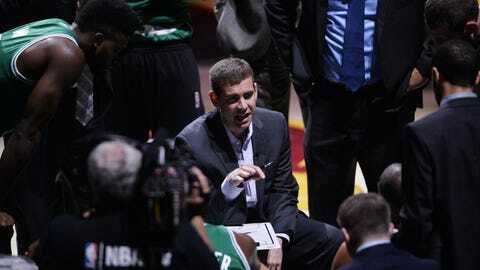 He's the reason the Celtics are in this series) was a negative impact player. 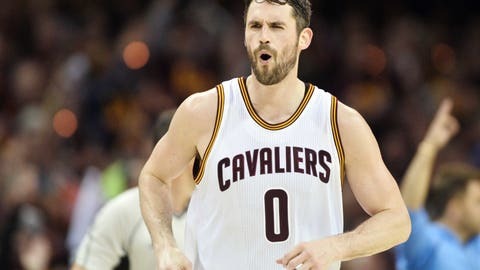 Who knows why it took either player two-and-a-half games to realize Kevin Love was guarding them, but that's what seems to have happened. 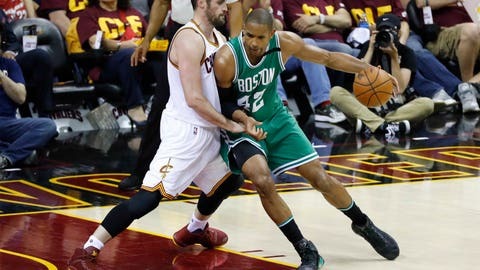 Once the "switch" was flipped and Boston' started to attack Love, the Celtics' offense became a factor in this series. 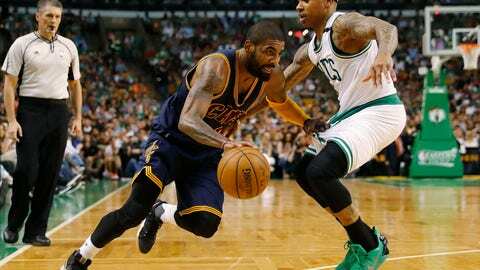 Love posted a defensive rating of 139 in the second half of the game (Kyrie Irving and JR Smith "led" the way with ratings of 143 and 141, respectively). Love was one of the worst pick-and-roll defenders in the NBA this season (along with Irving) and Boston really exploited his deficiencies with Horford and Olynyk. The Canadian was particularly important in this game — he was able to move Love around the court and subsequently had 10 points in the second half and a net rating of 63. You can bet the Warriors were taking notes on Brad Stevens' game plan. To reiterate: Horford was effectively a no-show in Games 1 and 2, which was a bit surprising considering the Cavs' big men rotations. You could argue that Horford didn't show up for the first half of Game 3 either — he had seven points but was a minus-13 in the first two quarters. 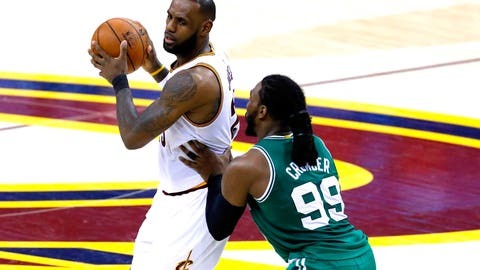 But he arrived in the second half and he did the things that Boston has needed all series: he stretched the floor with his 3-point shot and when he wasn't spacing he put his backside into the Cavs not-so-big big men and did work in the post. Cleveland had no answer for either option on the defensive end. If the Cavs make a bunch of 3-pointers in Games 4 and 5, that inside-out game won't matter much — three is greater than two — but Celtics fans have to be hoping it's a sign of things to come. No, Horford wasn't statistically impressive in the second half — he was 4-of-8 for nine points — but it was his style and influence (he started the half by posting up and scoring on LeBron — who had made Horford look small all series) which had a major impact Sunday. Jonas Jerebko had played a grand total of 86 minutes in the postseason going into Sunday's game. He only played 13 minutes, all in the second half, but they were special. What was this guy doing on the end of the bench? 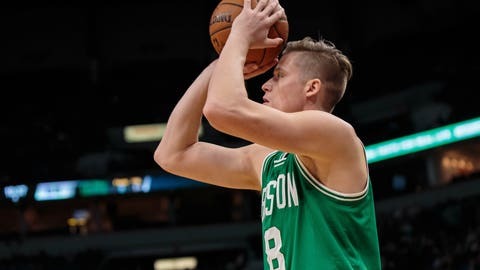 Jerebko scored 10 points on 4-of-4 shooting and pulled down five rebounds in that short span of time Sunday — proving himself to be the sparkplug that Boston needed in the process. Jerebko had a put-back dunk and then made two 3-pointers and had his foot on the line for a shot that tied the game at 106 with 30 seconds left. Anyone can be a hero in the playoffs, and while Avery Bradley's shot will be the memory of Game 3 for many, it was Jerebko's shots that helped set up that game-winning 3. Simply put, the Celtics didn't give up and they outworked the Cavaliers in the second half. TNT's microphones picked up Brad Stevens telling his bench "if we play harder than them, they will let us back into this." The Celtics' coach's statement proved true. 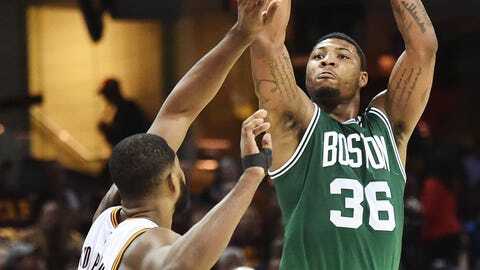 Marcus Smart is arguably the worst 3-point shooter in the NBA. He shot 28 percent from distance in the regular season — one of the worst marks of all-time — and 25 percent from the arc last year — the worst mark of all-time. Sunday, he hit seven 3-pointers. The long-distance shot is fickle like that. Pending another 3-point miracle, Smart isn't going to make seven 3-pointers in a game again — he'll probably fall short of hitting seven 3-pointers for the rest of the series — even if he gets open looks like Sunday's. But he did hit seven Sunday, and it's a big reason why there will be a Game 5 in Boston. A lot went right for the Celtics Sunday. A lot went wrong for the Cavaliers. Frankly, we shouldn't read too much into Game 3 — Cleveland is still in total control of this series. But it must be noted that Boston looked pretty good without Isaiah Thomas on the court. Perhaps it was a one-game blip — variance on multiple counts — or perhaps they are better equipped to win without him. Thomas is an offensively brilliant player, but the Celtics are a team that's built to play ego-free basketball — remember how they used to do that before IT became one of the most exciting players to watch in the game? Again, perhaps it was just variance, but how the Celtics look in Games 4 and 5, as compared to Games 1 and 2 and particularly the prior series against the Wizards, could tell us a lot.